My wife, Margaret, and I, wearing our new caps as Church Archivists, were invited to inspect a large, black, iron box which had been languishing in the Elders' Vestry for many a year. Raising the lid we were presented with an archivist's dream of bundles of letters, business notes, accounts and contract payment certificates dated 1928/30. They all related to the sale of the Congregational Church in the High Street, Bognor Regis and the construction of the new building in Linden Road. As the typewriter was still in its early days and word processors an H G Wells dream, there were no copies of letters 'Out' (except the odd one painstakingly copied by hand) and only a wealth of those 'In'. Thus when a business letter begins, 'Referring to you letter of so-and-so .... I can only infer from the answer what the original question was. However, sorting these into chronological order, reading and noting, re-reading and noting even further, I was able to piece together the whole exercise of uprooting and replanting a Church. The bare bones of this change were recorded in 'Historical Review of Bognor Regis Congregational Church (Triple Jubilee 1813 - 1963, published Sept 1963 and written by C.S.D Now I try here to add flesh and bring life once more into an old story. With no church member of 1930 still with us, or ancient in rocker to say, 'Yes, I remember that's how it was.' or 'No, it wasn't quite like that' I am on my own to bring - as you, dear reader - your imagination to bear. The stage is set. Read on. The first tremors on the Church seismograph were noticed, with some alarm, when a letter dated 4th January, 1928, from Tregear & Sons, Auctioneers, Valuers, House and Property Agents of London Road, Bognor (with branches in Aldwick and Felpham), fell on the doormat of the Church Secretary in Albert Road. The Pastor at the time was the Rev. Thomas Wemyss Reid, BA and he would have been informed immediately. The letter intimated that a certain client was interested in the site of the church at the corner of High Street and London Road and would be prepared to make an offer of £10,000. Tregears said they fully appreciated this was not a fair offer but were passing it on anyway. Another party, they also remarked, was coming 'down' to view the site during the weekend. Would the Church be interested? It appeared the property was suddenly considered to be of prime commercial value. The rumblings caused by the letter remained fairly low as some scoffed, 'What next!' and others, feeling the first stirrings of a new germ, remarked 'It's an idea!' Evidence - or lack of it - shows that things remained calm as months passed until in July when, according to Church Council Minutes, further letters were received from Tregears with reference to an application for the purchase of the Church Freehold Property and Institute. 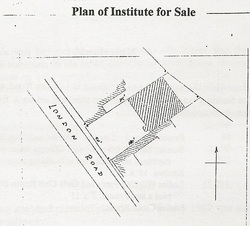 The Institute had been built on the east side of London Road (then called Dorset Gardens) in 1910 and used as a Sunday School and Lecture Hall. 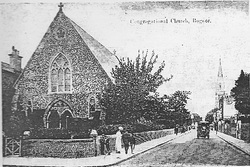 The Church itself had been in its present position since 1868, on the demise of the Hanover Chapel as the Congregational Church for Bognor, so a request to sell needed much serious thought and called for special action of the Church Council. Mr Tregear was asked to attend a meeting, to provide more information and give answers to some obvious questions, one of which must have been, 'If we sell, where do we go?' because he came armed with a list of possible sites and prices in Linden Road. The records do not show whether Linden Road was for preference or the only road and area currently available. It seemed the early tremors were caused by feet marching towards the Church's stronghold in the heart of Bognor. The congregation wrestled with the question, 'Do we man the walls - new ones, remember, ­or do we open the gates?' It was now time for a Special Church Meeting and one was called for 29th August, when the Rev. F H Wheeler, Moderator of the Southern Province, who had been kept informed, attended and addressed the members at length dwelling on the opportunity this offer was giving the Church of extending the scope of work. At the close, it is reported, when questions were asked, the tenor of remarks showed a good deal of opposition to the sale of the Church. In the following months, pros and cons were aired and the whole business of selling church property was discussed. Visionaries saw the Rev. Wheeler's 'extending the scope of work' as a viable challenge and, no doubt, the fact that other sites where one could build were available must have been attractive as also the idea that at last the Institute could be incorporated into the Church building where it belonged. Was it not time to make a move? On the other hand, the opposition were happy to leave things as they were and had been for the last sixty years. They would have been quick to remind their opponents that it was so recent that the Urban District Council had paid compensation for widening the road both in the High Street and London Road, new walls had in consequence been built round the church and some of the money used to help create a new organ chamber within the church building - the organ opening ceremony taking place in May of only last year! If the church was on a prime commercial, if temporal, site, was it not also on a prime spiritual one? Another Special Meeting was needed, said the Pastor, when voting should be by ballot and should address the questions (1) whether we are willing to sell, providing a suitable site can be got and if the price and conditions are satisfactory, and (2) whether we consider Linden Road suitable for a new site. Since its inception in 1868, the Church had been in the care of a Trust (a copy of parts of the Deed is given in Appendix A). At this time, of all the Trustees named in the Deed, Mr William Allin Hounsom was the only survivor and he lived in Brighton. Because in his duties he was alone and due for retirement, the Sussex Congregational Union (Incorporated) did, on 23rd January of this very year, 1928, accept the Trusteeship of the Church and their secretary and solicitor, Mr William Stevens, of Stevens, Son & Pope, also of Brighton, was informed, along with Mr Hounsom, still taking a keen interest, that moves were afoot in Bognor. The Union reminded the Church that a two thirds majority would be needed in making any decision of this nature. . According to a letter from the Pastor to Mr Stevens, there was a small but bitter opposition to the idea of selling. However, in November of that year, when the Special Meeting was held and it finally came to the vote, it was the 'liveliest members' who carried the day, with 71 votes for selling and 24 against. The Trust Deed's requirement of a minimum of two thirds majority was nearer three quarters and so the stage was set for the move. The Pastor remarked that the majority for selling was in effect greater than shown because the opposition had pulled every vote which was not the case for those who voted in favour. However, although the meeting had been outspoken, nothing had been said which anyone could later regret. But now, because the Church had been slow in coming to a decision, he was of the opinion that there was a need to move quickly. A small committee, therefore, was formed to consult with Mr Stevens and the Union. That Committee comprised six church members - Mr Mace, Mr White, Mr Parsons, Mr Legg, Mr W Wood and Mr Reynolds. Christmas was celebrated and over when in January the following year, 1929, a letter from Tregears revealed a name, stating that Timothy Whites Limited were interested and wanted to know whether they could have first refusal for one month. They did not say if their interest lay in both sites. Getting no immediate response, as the Church thought about the matter of selling all its property or part, by the end of the month Timothy Whites were getting anxious for a decision and in mid-February, they made a firm offer of £17,000 for the church only. A Special Meeting was called for Tuesday, 26th February but Mr Stevens for the Union reminded the Church Council that according to the Trust Deed, in order that the sale of a church may properly be made by the Sussex Congregational Union (Incorporated), it was essential that the provisions therein should be strictly complied with and that meant the meeting must be a Special one called solely for that purpose and notice of the meeting must be given out at two consecutive Sunday Services and the meeting itself to be held not earlier than the following Wednesday. In view of the large sum involved and also possible differences of opinion, it was essential, he said, that there should be no room for doubt on a point of this kind. The meeting was quickly changed to the Thursday. Cafe Chantant and Cafe Dansant and/or dances. Thus, to the Church's satisfaction, there was an assurance of an absolute ban on the premises being used as a theatre or cinematograph theatre (days of the silent film) and also as an ordinary licensed premises. It must have been obvious that Timothy Whites architects and contractors would pull down the old church and erect a purpose-built shop complex, so what could be saved? Items immediately to come to mind were the organ, perhaps the spiral staircase leading up to the loft, the pulpit and the pews. Church Council arranged through the Union's solicitors, Mr Steven's firm, to have these excluded from the sale and Timothy White's solicitors, Allen & Sons of Portsmouth were happy with that. However, later, when drawing up the contract the Council wanted to add to the exclusion list, the oak panelling and removable heating, Aliens protested and pointed out that these items had not been mentioned in discussions. Mr Stevens, defining 'removable heating' as boiler and radiators managed to get Allen’s to agree to add them, as well as the oak panelling. In the end, when final evacuation took place, only the organ, spiral staircase and four communion chairs found their way into the new church. Mr Reynolds agreed, if necessary, to store the dismantled organ free of charge, while half of the pews were offered to and gratefully accepted by the Wesleyan Church. In March 1929, Mr Stevens, Mr William Stevens that is, retired from the firm of Stevens, Son & Pope although he remained as Secretary to the Sussex Congregational Union and with him went that personal link, although the firm continued to give their valued service as legal advisers to the Church. In July 1929, the sale of the Chapel was completed and the sum of £17,000 came into the hands of the Union who, in turn, handed over the keys to the property. Of the monies now in hand, £13,500 was deposited in the Westminster Bank in Brighton in the name of the Union (£5,000 subject to 7 days notice and £8,500 subject to 6 months notice). The Union retained the sum of £500 for Estate Agents' commission and other expenses and £3,000 set aside for the purchase of a new site. Ever mindful of the Church being a worthy cause, if not a charity, the solicitors were asked to explore the possibility of getting a reduction in Tregears' commission At that time Tregears were church-going non­conformists although of Wesleyan persuasion and might, it was thought, be sympathetic. Stevens spoke to Mr William Stevens and all were disposed to agree that it would be better for Tregears to be approached locally, rather than by them. So, the Church did. The answer from Tregears was 'No' but they would donate the sum of £10 towards Church Funds and Messrs Brackett & Sons, agents entitled to a moiety on the commission, would do the same. An awkward, if not dangerous, precedent was thus avoided. When the full commission was eventually paid, a formal receipt arrived, accompanied by two cheques, each for £10. (If you don't ask. ..?) The Committee did not dare to approach Stevens for a reduction in their legal fees but they, on their own account, not only lowered them but donated 10 guineas to Church Funds as well. Church members now dispossessed of their church were glad to still have the Institute just up the road. Sunday Services and other weekly meetings, especially for the children, could continue there until such time as the new building was ready. However, it was still at the site acquisition stage and thus would be a long time. Even so, by October, it was felt the Institute caretaker, Mr Gibbons, should be made aware of the situation and pending sale of the building, and it was agreed that he should, as kindly as possible, be given notice that his employment would terminate on the vacation of the premises, a definite date to follow later. This, however, raised the question of a caretaker for the new building and so a sub-committee was formed to discuss the whole position of that post, ready for when it should become available. Corner of Linden Road/Parklands was the first choice but there was the possibility of some restrictions regarding neighbouring properties which it was unlikely could be removed and Mrs Baerselmann had been advised her site was worth at least £1,700, so negotiations were called off. The next best site seemed to be Hawthorns gardens but at first the owner, thinking that the church wanted the whole property but finding they only wanted the garden, declined to negotiate, then, on further consideration, changed his mind asking £3,500 for the adjoining site to his garden. The Church, again ever mindful of its need to economise, said they could not go beyond £3,000 and through Tregears the owner eventually agreed to the Church's offer on condition that no building should be nearer Hawthorns kitchen garden than 20 feet and the trees near the wall should be retained but kept trimmed. Later, when plans were under way, the distance between the building and garden was, by agreement, reduced first to 15 feet and then to 10 feet. In March 1929, in questioning whether there were any building restrictions on the Hawthorns land, a wire received from Mr Ballantyne's solicitors stated they knew of none but suggested reference should be made to the deeds. A further wire from Mr Ballantyne himself said he had gone through the conveyance (Henry Marshal to T Ballantyne) dated 25/3/22 and found there were no restrictions as to building of any sort. The contract was received for the purchase of the site but Church Council wanted to delay the closing date until July when the sale of the old church was to be completed. They mentioned making use of the £1,700 deposit placed by Timothy Whites towards the purchase but were firmly told that it should remain in the hands of the solicitors until such time as completion. Stevens thought, because of the coming season, it might be advantageous to start building operations in May rather than July. They were prepared to ask Mr Ballantyne to delay until 24th June if the Council agreed, which they did, and this was accepted. Stevens also thought the owner would allow them access for the purpose of plans being prepared without any further payment than the original deposit. The architect enquired about a chicken shed on the property which could, he thought, be used as a store or foreman's office and Mr Ballantyne kindly agreed to leave it in situ. Also there was seen to be a need for access to the site from the rear. Thus it was decided to try for a right of way through to Burnham Avenue and this required negotiations with a Mr F B J Stephens and, ultimately, Southern Estates Limited. Aiming for a right of way and drainage, it was queried with the solicitors as to whether the Church could be caught for road charges. They said that provided the right of way land was not actually bought, there would be no possibility of that. Southern Estates Limited were prepared to grant access so long as no part of the site was used for trade, manufacture or business and also for any carting of materials. As the builder would enter the site from Linden Road, this last would cause no problem. And with regard to the first, Jumble Sales and charging for concerts etc. did not constitute a business nor Sales of Work, manufacture. Cost of right of way was £50. This was beyond the church purse. To lower this figure he suggested a reduction in the cubic capacity of the building, having based his assessment on 1/6d per cubic foot for the church and 1/3d per cubic foot for the rest. 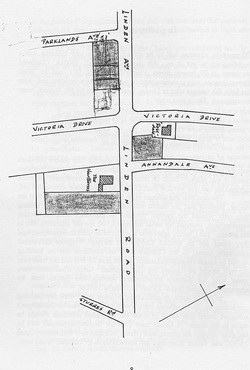 Thus a revised mounted plan dated 17th May 1929 was accepted. Tenders were invited, two from London, one from Guildford, one Frinton and four from local builders. The tender of Mr W H Seymour of Bognor was the lowest, being £700 below the next highest. The highest was for £19,162 plus £487 if oak panelling required. Mr Hennell suggested acceptance of Seymour's bid and commented that the Church already knew he was a builder of good repute. Seymour's tender was for £16,181. 3.10d plus £350 for oak panelling, having allowed for deal in his estimate. He was asked, when coming to a decision, if this figure could be reduced and was told it was the lowest he could go on the supplied plan and specifications, but he would try to make some reductions where possible. 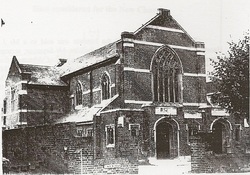 On the 2nd September 1929, the Committee reporting to Church Council, through Mr Legg, asked them to confirm the signing of the contract at the tender price but stating it would be subject to some alteration and omission during the course of erection, to bring the cost of the building down to roughly £15,000. The proposal was carried and Seymour accepted the possibility of some alterations. With reduction in cost in mind, when Church Meeting was asked in August 1929 whether they wanted oak or deal or plaster panelling, they went for plaster, saying that oak could be added at a later date when more money was to hand. & 97 Jermyn Street, W.
The site of the proposed buildings is on the South side of Linden Road, adjoining the Hawthornes. The proposed buildings comprise the Church and Church Hall and Club Rooms and while it is hoped the whole scheme will proceed at once, it may be necessary to erect a portion only at present. The Employers do not bind themselves however to accept the lowest or any estimate, either in whole or in part nor will they be responsible for any costs incurred by the Contractor in the preparation of same. The Contactor is required to inspect the drawings and the site to make himself acquainted with the nature of the work, position of the site, means of access and all other matters likely to affect his tender before sending in same as no allowance whatever will be made at the settlement of accounts for any neglect in this respect on his part. According to the Specifications, running sand had been found at 6 feet when a trial hole was dug and the foundations had to allow for this. Materials required to be used: Bath Stone to come from Hartham Park Quarries, Portland Stone from site on the Isle of Portland, bricks to be sound, hard, well burnt, square cut and from local stock. Plus Lettering 'V' cut at 9/-d per dozen letters. would have cost £1. 19. 0 each, plus lettering. Proposal was that the Ceremony be held on 11th December next or 1st January, and that we have tea in the Institute followed by an Evening Meeting and, if possible, secure the services of Dr Berry as Speaker. However, it proved difficult to get any celebrity stone layers, apparently Sir James Carmichael was not available. Neither was Dr Berry, nor Mr Hounsom, as it turned out. They settled for tea in the afternoon. 300 programmes were printed. When it came to the actual ceremony - on a very muddy building site, because although it was not raining at the time, it had been very recently -the first stone was laid at the front by the Rev F H Wheeler DSO as Moderator of the Province, the second, also at the front, by Mr William Stevens JP for the Sussex Congregational Union and third, round the back on the Institute part of the building, by Mr C L Clements for the Bognor Church. Also present as guests, were the Rev. P Hodgell of the Baptist Church, the Rev. Herbert M Lee of the Wesleyan Church and the Rev. A E Proctor for the Primitive Methodists. For the occasion, the builder presented a special mallet suitably inscribed on a silver plate. Electric Light 50. 0. 0. Omission of panelling 243. 8. 10. Boundary wall 40. 0. 0. Roof to Nave 22. 2. 6. Flat roofs 33. 4. 0. The oak panelling. At the Church Council Meeting when these savings were discussed, it was decided to recommend to members that, in view of the possible reductions as shown and interest accruing on deposit at the Bank, to recommend the acceptance of the oak panelling round the Church as was originally intended. This was approved. Most major construction jobs seem to suffer from delays and hiccups, due to last minute alterations and changes of mind and growing pains were also felt here. With the whole church eager to see results and bearing the inconvenience of holding services in temporary conditions, the builder was urged to press on. One complaint was made when there seemed to be a delay in the completion of the Hall and adjoining rooms. In the early days of the work, the Church had been asked if the Institute or the Church should be completed first. They had elected for the Institute. They needed continuity of the Sunday School and youth groups and could hold normal church services there while the Church was completed. This would release the London Road Institute for sale and end the old regime. Seymour got his Foreman to make a report and he related how, in April, the Church Committee actually met on site to decide on the plastering, electric light fittings, gas points and cooking arrangements for the Caretaker and went away having not decided on anyone of these points. Then the roof slating over the Ladies Club Room was held up because it was decided to erect a fireplace through; this was immediately put in hand only to be halted on a change of mind, affecting steel work ordered. It was also reported to Church Meeting on 8th May that in the Ladies Room, half the wall dividing the workrooms from the door on the south side was dismantled and two large cupboards added. Also a skylight was asked for in the Ladies Parlour. By this time, the need to appoint a caretaker was growing but it was still proving difficult to define his duties. It was thought a wage of 30/- a week with Flat, light and heat might be appropriate but with no gratuitous payments, except for efforts not connected with the Church. After further discussion, it was decided to include light and heat within the wage but allow gratuitous payments, the question of extras being referred back to the Sub-committee to draft out a scheme. Applicants were narrowed down to one, a Mr Evans, and it was agreed to employ him on a six months trial, subject to a satisfactory medical report. Mr Evans was eventually employed from 1st June 1930 at £1 per week, or the equivalent of Unemployment Benefit until the vacation of the old Institute. (It appears to have turned out to be £1 for the first week and 12/6 each succeeding). He finally took possession of the flat in the new building on 21st July. Later still, after his six month's trial, he was confirmed in his appointment, but there is no record on what terms, the same having yet again been referred back to committee. The paucity of detail and description of building progress as shown in the surviving minutes of Church Meeting and Church Council leaves one to have to imagine the actual construction of the building with its vestibule, nave, transepts, chancel, vestries, hall, institute and caretaker accommodation above. Looking round now, seventy years on, one can see the results and admire the height, the arches in the Gothic, or Perpen­dicular, style, the graceful sweep of the chancel ceiling, the mullioned and leaded windows, the organ loft and its pipes, the solidness of oak panelling. With regard to the Chancel window, it appears, members had a choice - plain glass, tinted glass or reflectors (whatever they were). We see, probably because of cost, the result was plain glass. All of this was brought together through the architect's vision and the skill of the builder and his tradesmen in the old style - bricklayer, mason, slater, carpenter, joiner and ironmonger, founder and smith, electrician; plumber, painter, plasterer, glazier, pavior and who else. to direct visitors to the new Church in Linden Road. Through trials of various kinds, the building came to virtual completion, and installation of all the bits and pieces could begin. Firstly, came the pews. Two samples were produced by Geo. Shears & Sons Ltd of Bournemouth and a choice made. The question of chairs or pews in the transepts ended in pews with a narrow centre aisle. Members, however, expressed their concern that they had envisaged seating for 300 people and asked Shears to do a revised plan to see if anything like that number could be achieved. Shears tried but members came back to the first choice, leaving comfortable leg room between the rows. The revised plan for the transepts was chosen. Shears working on the project were concerned when, in Apri11930 they heard from Mr Hennell that there was now a last minute suggestion to use tip-up seats. Their comments at this revelation were that if tip-up seats should win the day, they would certainly expect some compensation for all their trouble. The Church would surely realise the justice of that suggestion. But, they sincerely trusted, for the sake of the church, they would have pews which, without a shadow of doubt, would be the correct thing for the new building. Mr Hennell's design for the end of the choir stalls was accepted. Long pews were ordered to cross the nave, having access at either end but, because of their length, in November one of them collapsed. It was agreed, as advised by the architect, that metal brackets of 1" iron be fitted to the longest pews. Cost, 4/9d each. It was suggested by Shears that they should also be fitted to the second longest and would amount to 24 in number. Shears did not feel that all the expense should come entirely upon themselves as they had provided all that had been arranged. They would, however, bear the cost of travel and do the job themselves, the church to bear the cost of the brackets. The total cost for pew installation was £793.17.6. The pulpit was the next major fitment to be given consideration. The architect offered a design in Bath Stone with steps and outer handrail, bearing in mind, as required by the Committee, that it should be large enough to accommodate two ministers at one and the same time. - cost £92. 10. 0. but if the members preferred one in oak, it could be accommodated on the stone base above the capping. Mr Reynolds proposed, and it was agreed at the time, that Mr Hennell's design be accepted, executed in stone, changing the tracery to Arcading. Before making a decision, members were invited, and took the opportunity, to view the church interior one Saturday and Sunday afternoon. The result at the next meeting was 8 people voting for a stone pulpit and 15 for one in oak It was agreed to ask the architect to come up with a cheaper and modified design in oak, and this he did. Again, Shears were given the work. Through the architect" Holophane Ltd (Scientific illumination). 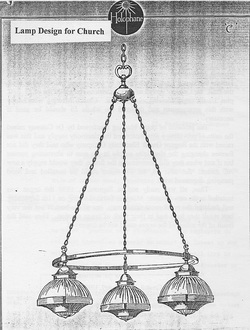 of London, provided designs of pendant cluster lamps with three 40 watt and one 150 watt lamps. Cost within the region of £12 per lamp excluding wiring. These were fitted in the nave with a modified form in the transepts. The next important addition was the organ. 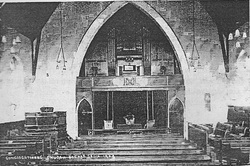 In 1924/5in the old church, the organ had been inspected by Mr Whitehead of Whitehead & Whitehead of Bognor and a Mr F C Baker of Brighton, who each gave his opinion on necessary repair work and improvements to extend its range. It was a three-manual chamber organ, purchased second-hand Professional organ builder firms, namely Henry Speechly & Sons of London and Morgan & Smith of Brighton made inspections and reported likewise, giving prices for the work. The tender received from Morgans was for £720 plus a new pedal Bourdon and 8ft Flute and this was accepted. Because of the amount of money involved, the Church Committee set up an Organ Fund 'to help meet some, if not all the expense. There followed the construction of a new organ loft, hardly completed before the decision was made to sell the church. Removal and future erection £126. 0. 0.
a new Open Diapason 60. 0. 0.
on Pedal Organ 64. 0. 0. New Swell-box to Choir Organ_ £46. 0. 0. As the town's electricity supply was at this time by direct current and it was thought it might be changed to alternating, a new blowing plant would be needed and this would cost another £60. Now, twelve months later, with the building virtually complete and the new organ loft fitted with the spiral staircase removed from the old church, all was ready to receive the organ. The architect asked for the side arch of the loft to be covered in and suggested pipes. Morgans said they had anticipated a new Open Diapason, the cost £60 included in their price. However, if used as a front there would be a further cost of £16. To defer such expense, if it was inconvenient for the Committee at this time, then they suggested fixing 15 voiced pipes at a cost of £30 but to remain dumb until the remainder of the stop was installed at some later date. The builder, Mr Seymour, was asked to quote for sham pipes and offered board painted in aluminium with black mouths, all for the sum of £14.10.0 Morgans, hearing this, said, if contemplating imitation pipes, they could fit these for £25 but they could never speak. They strongly recommended voiced pipes for the extra £5. In the end they offered and fitted voiced pipes for the lower price of £25. In the latter days of the old church the organist had been Mr Wood, who had given excellent service until of late when absences from his duties became too frequent and letters requesting some explanation went unanswered. In the end it became necessary to give him a Quarter's notice to end his engagement in December 1929. Thus, in October 1929 Miss Johnston, who had been standing in, was engaged at £26 per annum. Miss Johnston, however, would need lessons but this was obviously delayed until such time as the organ was rebuilt. However, in this connection, a Mr Phillips was reported as generously donating £10 to the general thanksgiving fund with the suggestion that £6 be put towards lessons for Miss Johnston to be given by Dr Conway and the other £4 to the fund. Dr Conway agreed to give ten lessons for a total fee of £3. 3. 0. plus 1/- for organ blowing each session. Church Meeting were happy with this arrangement and declared the whole £6 should be used if necessary. The problem of organ blowing mentioned by Dr Conway raised the issue of providing a new motor and the electricity supply and this was raised with the Bognor Gas & Electricity Company who said they did not foresee changing the electricity supply in the area to alternating current but if and when they did, sometime in the future, they would supply a new AC motor. So, after all, the old motor could be installed and hand pumping dispensed with. Thus, all was ready and in September, 1930 the organ was installed in the new Church. Morgans finished tuning on 11th September and declared the result most satisfactory, one of the best, if not the very best result they have had in their work of organ erection. They said the result of the sound of the organ could not be improved. Back in 1928 Whitehead & Whitehead had prospective buyers offering £5,000 and £6,000. Tregears also had clients offering the same kind of figures as well as another important London firm of Business Agents offering £5,000 for the Freehold or 99 years Lease with a ground rent of £100 per annum and a Cash Premium of £3,000. Somehow, these selling opportunities did not seem right at the time, especially as the Church had had to be sold as a separate entity. The fact that the building could still be used for Church Services may have been a good reason to delay. However, in 1930, when the new building and especially the Institute was imminent it was time to let go and Reynolds & Co were asked to sell by auction. The date was fixed as 26th May. Reynolds elected to sell two properties at the same sale, the other being the Bognor Urban District Council offices in the High Street. In view of previous offers, the Church decided to place a reserve of £6,500 and also informed Reynolds that they were once more adding the restriction that there should be no sale of alcoholic liquor on the premises. When questioned 'what about a licensed restaurant', the answer was that such a business was included. Reynolds pointed out that such a restriction would adversely affect the bidding, especially as they, in their promotion, had emphasised that Bognor was rather short of this class of accommodation. In such a case, if they persisted, the reserve should be lowered to £5,000. This was agreed. a large CONCERT HALL, other large rooms, kitchen and offices. The sale went ahead and the Institute was sold to a Mr J R Hansford for £5,000. Reynolds and the builder, Mr Seymour, arranged removal of everything in the building, with the help of volunteers from the Church organised by Mr Mace. Completion was arranged for 14th July but, because the new Institute could not be ready until 26th July. Mr Hansford, when asked, kindly agreed to the Church remaining until the 1st August, when the keys were officially handed over. With all bridges broken and boats now burned, the members turned their eyes toward Linden Road and a new beginning, as the Rev. Thomas Wemyss Reid, BA led his people out of Egypt and into the promised land. rooms per Builder by 26th July. First Services in new Hall on 3rd August. The first part of the new building to be opened was the Institute. As mentioned earlier, members had elected to have the Institute finished first. There was, perhaps, the thought that it, like the old one in London Road, could keep everything going, especially for the children and youth activities without a break and Sunday Services could be held in the Hall while the builder continued on the church to eventual completion. At first it was hoped all would ready by 8th June to coincide with the Sunday School Anniversary but that was not to be. Eventually in July a brief opening ceremony of the new Institute was held with the Pastor officiating and Mrs Reid turning the key. For many weeks Meetings had been occupied for a good part of their time on the Opening and Dedication Service for the Church. The Pastor agreed to prepare 750 souvenir programmes, portraying a picture of the outside of the church, together with hymns and order of service (No picture materialised). Mr Wyatt would make some posters, window bills would be printed by Ackfords and two weeks notices would be placed in the Post and Observer newspapers. And Mr Pye would write the tea tickets. Price of the tea - 9d but speakers would get a complimentary tea ticket as usual. The Tea Committee was concerned at the state of the tea urns wanting a decision on whether to repair them at a cost of £3. 3. 0 or buy new at a cost of £8. 8. 0. In spite of the new look in a new building, they were denied Aladdin's old for new and were told to repair. Eventually all was done, even to the gates and circular road in the front and grass laid down as far as the transepts. The important and necessary dedication of the building could take place. The Opening and Dedication Service was held on 29th October 1930 presided over by Dr Robert Horton MA, one of the eminent ministers to preach in the church. Others included Dr C H Dodd and the Rev. Elsie Chamberlain. At a Public Tea in the Institute after, the Chairman was the Rev. William Silver BA BD, Chairman of Sussex County Union There followed an Evening Meeting when the Chairman was the Rev. F H Wheeler DSO and addresses given by the Rev W Major Scott MA from Hampstead Garden Suburb Free Church and the Pastor the Rev. T Wemyss Reid. The day of celebration ended with the ringing Hallelujah Chorus. In May 1931, application for certification as a place of worship (cost 2/6d) and registration for the solemnization of marriages (Cost £3) were made. Completed forms together with an obligatory plan of the new building on which all doors, passages and stairs had to be shown, were sent off to the Superintendent Registrar of Westhampnett Rural District Council for onward transmission to the Registrar General. The forms were returned, when it was noted, the building included a caretaker's residence. A further notice was required that the portion in question would be used solely for that purpose. This was given and forms sent off again. Then a Notice of Disuse was required for the old building in the High Street and this was also sent off. Finally the Registration Certificate was issued and received and then forwarded to Mr Stevens of the Sussex Congregational Union (Incorporated) for preservation with the records of the Church. The Church in Linden Road was in business. The tale is told, the web spun. We who now reside and worship in our Church here in Linden Road, may, perhaps, see it in a new light. Built first with some 'misgiving and not a little heartache as a few felt it necessary to leave their beloved church for another congregation, then with hope and optimism and finally excitement the people of 1930 celebrated the dedication of their new building, and, sated with ninepenny tea, rejoiced into the evening, singing the Hallelujah Chorus to welcome in God's new House. The cast portrayed in the documents, have played their part. The script, with its multitude of papers, carefully wrapped in the pink tape of legal renown, and boxed against the modern world, will find its way into the care of the County Archivist and the West Sussex Record Office, there to rest in perpetuity only to awaken when some far-distant historian asks, 'What happened to the Congregational Church in Bognor Regis?' and the play is told once more. New Site and Right of Way 3,050. 0. 0. Builder W H Seymour 16,271. 8. 0. Geo. Shears & Sons Ltd (Pews etc.) 902.10.11. Morgan & Smith Ltd (Organ) 163. 5. 0. Architect's Fees & disbursements 966.17. 1. Agents' Commission on two sales 477.14. 1. Legal Fees and expenses 217. 4. 9. Balance due on Organ Fund Account 519. 5. 4. Interest on purchase money/sundries 3.15. 1. This INDENTURE made 7th July 1869 between HENRY HOUNSOM of Brighton in the County of Sussex Gentleman of the first part and SAMUEL MORLEY of 18 Wood Street in the City of London and Stamford Hill in the County of Middlesex Esquire. Convey to Trustees that land formerly in occupation of John Brickends since occupied by James Munday. Henry Hounsom agreed with above persons for absolute sale of the Land Chapel Building then subject to restrictive covenant and subject to Mortgage Indenture and principal sum of £800 and intend for the sum of £200 and trustees required him to convey the same upon the trust Henry Hounsom convey all for £200 to have and to hold for ever as joint tenants upon their Trusts to be used occupied and enjoyed as a place for the public worship of Almighty God according to the principles and usages of Congregations commonly called 'Independents' or 'Congregationalists' under the direction of the Church for the time being assembling for Worship therein and for a Sunday School and for the promotion of such other religious or philanthropic purposes as the said Church shall direct. To permit repairs alterations and enlargement for the accomplishment of said purposes. Receive all money for use of pews and sittings to be applied to payment of interest on the said £800 and any further borrowings. Residue to maintenance of Divine Worship. Only Officiates - Minister(s) or Pastor(s) as Independents or Con­gregationalists and shall hold teach preach and maintain the doctrines set forth in the Schedule. The Divine and Special Inspection of the Holy Scriptures of the Old and New Testaments and their sole authority and entire sufficiency as the Rule of Faith and practice. The Unity of God with the proper Deity of the Father of the Son and of the Holy Ghost. The incarnation of the Son of God in the person of the Lord Jesus Christ the Universal sufficiency of the atonement by his death and free justification of sinners by faith alone in him. Salvation by grace and the duty of all men to believe in Christ. The resurrection of the dead and the final Judgement when the wicked shall go away into everlasting punishment but the righteous into life eternal. Public Worship: Sundays, at 11 a.m. and 6.30 p.m.
Thursdays, at 8.15 pm. N.B.- During the season, special short holiday services are held every Sunday at 10 am. The Sunday School meets every Sunday afternoon at 3 p.m.
Joint Secretaries: Mr. H. J. Parsons, Beechenhurst, Barrack Lane, Aldwick; and Mr. H. F. Legg, Kingsley, Parklands Avenue; Bognor. Minister: Rev. T. Wemyss Reid, B.A., Sarbourne, Durlston Park, Chichester Road. We are proposing to publish a news-sheet every two months so as to keep .members and friends of the Church informed of, its activities. In this 'issue appears a detailed account of the new Church and Sunday Schools prepared by the Architect, Mr. Sidney T. Hennell, F.R.I.B.A. We hope, in the course of a week or so to have plans and drawings of the new buildings placed in the vestibule of the Institute; but in the meantime we are glad to have Mr.Hennell's description of the new Church in Linden Road. As I write, the site is still vacant, but when the next news­sheet appears, I hope to report that the work is steadily advancing. Full details of our forthcoming Bazaar have been sup­plied by Mr. Parsons. We want to make this effort a great success. Our current finances have suffered some­what during this year of transition, and we are hoping. that the Bazaar will have an encouraging result. We are indeed fortunate in our openers, and all that is needed now is the loyal co-operation of everyone. I would specially call attention to the sale of Thrift Tickets. Their purchase is of real benefit to the Bazaar funds. ..
Our Guild Committee is arranging an interesting series of lectures for the winter months. In our next issue we 'hope to be able to publish a detailed programme, when it will be found that some of our favourite lecturers are visiting us again and that room 'has been found for others who are as yet unknown to us. May I also remind you of the special holiday services which we are holding every Sunday during the season at 10 a.m. They last half-an-hour and are specially designed to meet the needs of those on holiday who are unable to attend the service at 11 o'clock. Our experience last season proved their value, and we noticed that numbers increased as they became better known. I would also extend a very hearty welcome to visitors to Bognor who may attend our services. We are always glad to see you. It is often our pleasure to welcome again, friends who have visited us in former years. May you carry home with you none but happy memories of your visit to Bognor. The Site for the new Congregational Church, Hall and Sunday School is situated on the South side of Linden Road, three minutes' walk from the Railway Station, having a frontage of 90 feet to Linden Road and a depth of 300 feet. 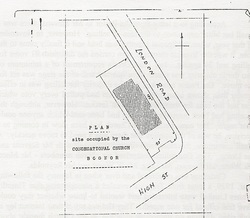 As the site selected has only one frontage to the road, the buildings have been, planned so that a private roadway may be constructed to run the entire length of the site, terminated with gates leading to a private road leading to Burnham Avenue, thus making it possible for people to approach the Church, etc., from the north by Linden Road and the south from Burnham Avenue. The planning of the buildings has been so arranged to form a composite building, the Church with the main en­trances to Linden Road is separated from the Hall adjoining by a 6-foot corridor, and a similar corridor separates the Primary Department and other rooms from the Hall. 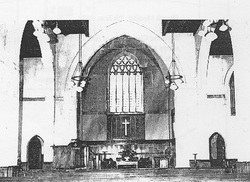 The Church is cruciform in plan, with chancel 21 feet by 18 feet, where the choir of 36 stalls is placed, the organ and the communion table; the transepts are 18 feet by 15 feet, the Nave 54 feet x 25 feet, and aisles 6 feet, the seating accommodation totalling 440. Adjoining the chancel is the Choir Vestry on one side, and the Minister's and Deacons' Vestries on the other side. The Choir Vestry, 24feet by 16 feet, has been planned and designed for use as a chapel with seating accommodation for 60 people. A Corridor 6 feet wide, which connects the Vestries, separates the Church from the Hall and has doorways lead­ing into the Hall. The Hall, 53 feet by 33 feet, with platform and seating accommodation for 450 people. The Hall is so arranged that it may be used as an Assembly Hall for the Sunday School, for entertainments, etc., and provision made for its use for lantern and cinema lectures, etc. Separating this Hall by means of a similar 6-foot Cor­ridor, are the various class rooms for Primary, 27 feet x 22 feet, and Beginners, 22 feet x 16 feet; Boys' Rooms, 23 feet x 22 feet, and Kitchen, 15 feet x 12 feet, this latter placed in close proximity to. the Hall for serving teas, etc., when the occasion arises. Above the class rooms on the First Floor is placed the Ladies' and Girls ' Club Rooms, and Caretaker's Quarters. The roof inside will have the chief members of the trusses with the curved brackets, etc. visible and the re­mainder boarded in, designed in panels. The Church, etc. will be lighted 'with electricity and electrical power-wiring for cleaning purposes and heated with radiators, etc. Grace the Duchess of Richmond and Gordon; Chairman. EXTRACT from the Rules and Regulations prescribed under the Marriage Act, 1898. For the Guidance of AUTHORISED PERSONS and of the Trustees and other Governing Bodies of Registered Buildings in which Marriages may be solemnised without the presence of a Registrar. 1. No building can be used for the purposes of the Marriage Act, 1898, unless it is registered for the solemnization of Marriages, and unless the Registrar-General is satisfied that sufficient security exists (l) for the due registration of Marriages, and (2) for the safe custody of Marriage Register Books; nor unless (3) an Authorised Person has been duly certified by the Trustees or other Governing Body to the Registrar-General and to the Superintendent Registrar of the District in which such Register Books have been supplied by the Registrar-General. 2. The Trustees or other Governing Body of a Registered Building authorised to be used for the purposes of the Marriage Act, 1898, must provide a Fireproof Iron Safe which must be kept in a dry and secure place within such Building.